There is another London. The City is a theme park of glittering spires, columns of Portland stone, imperial detritus and scattered, leafy squares. But just a few miles away is another world, a seething morass of desperation and neglect. Stratford. The streets are occupied by amoral teenagers, the apparent offspring of Alex DeLarge’s droogs. In Borrowed Time, anyone who has the means shrinks from the outside world, frantically scrabbling their way to middle-class respectability or simply barricading themselves away from it all. Those left to walk the streets live in a dog eat dog world. Our hero in this hell is Kevin (Theo Barklem-Biggs). Kevin is 18, tall, skinny and sweaty - at one point he’s referred to as Gollum - a great comparison. He’s a born loser, half-heartedly victimised by the other children and partially disowned by his older sister Becky (Juliet Oldfield), who’s gotten sick of his kleptomaniacal habits. He’s so obviously a sucker that when small league criminal ‘Ninja Nigel’ (Warren Brown) spots him, he immediately draws Kevin into a world of petty crime, and violent intimidation. Almost immediately Kevin ends up owing Nigel a thousand quid, so, on the urging of his friends decides to burgle an pensioners house to raise some funds. 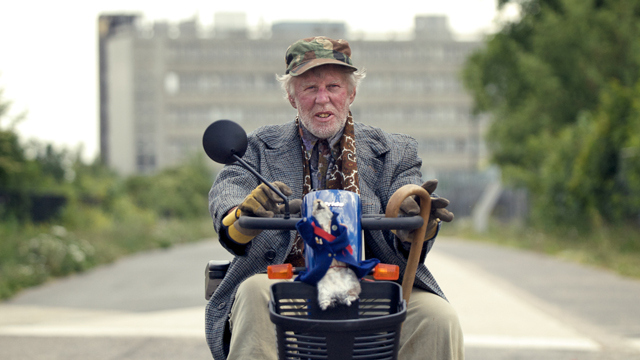 That pensioner is Philip (Phil Davis), an angry old coot that holds Kevin at gunpoint with an antique blunderbuss and threatens to blow his head off. From these unlikely beginnings the two soon strike up an shaky friendship: each are able to help the other with their problems, be it a Kevin's psychotic, violent thug or Phil's morbid, suicidal tendencies. 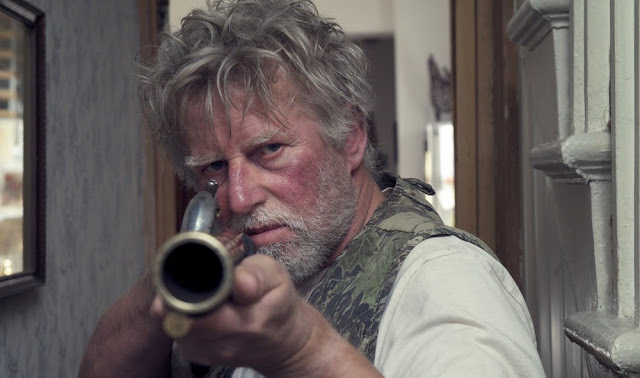 There’s a lot to admire in Borrowed Time, the most obvious being the standard of actingPhil Davis, Theo Barklem-Biggs and Juliet Oldfield are all fantastic. Both Davis and Barklem-Biggs bring a carefully distinct physicality to the parts. Kevin walks with a drooping, depressed slouch: hands in his pockets, head bowed. He moves as if the weight of the world is pressing down upon him. When the world lashes out at Kevin he takes the beating stoically, as if he has come to accept that this is his lot in life. Appropriately enough Philip moves as if he’s half-dead, grimly dragging the misbehaving parts of his elderly body around his rotting house. 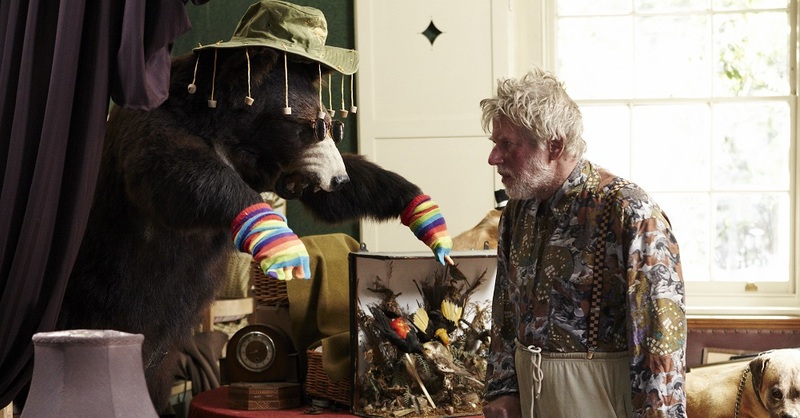 His hobby is taxidermy, and when sat in a tattered old chair surrounded by creepy, glassy-eyed animals he looks half-stuffed himself. Davis, who is 60 this year, convincingly plays much a older man, regrets and twisted bitterness visible in every spat-out insult and twitching grimace on his face. Further conveying a this feeling of angry isolation is Philips habit of repeating things over and over, a tactic that makes him seem genuinely unhinged rather than 'cute-kooky'. The relationship between these men is the heart of the movie, so a massive boon that they’re embodied so convincingly - we may not like them, but at least we believe that they could be real people. Slightly less well developed is our antagonist, ‘Ninja Nigel’. As the driving force behind Kevin’s actions we have to accept him as a genuine threat. Half the time he is, but the other half it’s like he’s stepped out of a completely different film; playing a clownish martial arts obsessed buffoon. The two halves of the character are never integrated properly, and he's rather cartoonish in a film that otherwise sticks to a kitchen sink realism. Similarly pretty lame are Kevin’s friends, who thankfully only appear in a few scenes. They act like middle-class drama students told to behave how they imagine poor people do. It’s exceptionally annoying, but wisely they’re excised from much of the film. But the film’s critical problem is the characterisation of Kevin, who is unpleasant from start to finish. This is absolutely nothing to do with Barklem-Biggs’, who does the absolute best he could with the role, but rather with the character's actions as the plot. It’s a brave move having an obviously uncharismatic protagonist in a movie and it’s almost shocking how quickly you dislike Kevin after the film begins. He’s utterly gormless: stealing from his sister, being victimised by everyone he meets, being manipulated into burglary, stepped on by all and sundry - sucking away the audience’s sympathy in a black hole of ineptitude. At about half an hour into the film I realised with a mild sense of surprise that I was actively rooting against Kevin, while he wants to reconcile with his sister she's obviously right not letting someone like this hanging around her son. Even Kevin's inevitable redemption is sour, the character resorting to the precise kind of bullying and intimidation that caused his situation in the first place. It’s a false triumph, a continuation of a cycle of violence that we can see leads absolutely nowhere. It's a shame because Borrowed Time is otherwise smartly put together film that makes great use of its low budget. The streets of Stratford are shot to underline the economic misery and desolation of the area, everything existing under a cold, grey overcast sky. There’s frequent shots of the skyscrapers of the City of London off in the distance, reminding us that events like these aren’t some alien, distant problem - they’re right on our doorstep. There’s a similar intelligence applied to the scenes within Philip’s house. He’s frequently framed with a snarling stuffed bear looming behind him, a symbol of the man himself, old, dusty yet fierce and aggressive. The entirety of Philip’s house is crammed full of intricate details, every single dusty ornament and piece of trash subtly telling us something about Philip’s character. For all these clever, smart touches, Borrowed Time is a flawed film, though it's easy to appreciate the performances, aesthetic choices and the general political slant of the movie. But as an audience we’re never even close to taking Kevin’s side and this lack of connection with the character drains the emotional heart from the film. It’s a pity because this is an otherwise assured debut from director Jules Bishop. He demonstrates an instinctive knack for marrying place with character, successfully guiding us through this not obviously cinematic 'other London'. But never quite convinces us that we should root for Kevin, and without that, Borrowed Time never quite lifts off.